The Bottle-Matic Labeller has been developed to apply 1 or 2 labels (front & back) to a wide range of Cylindrical containers and is ideal for Bottle labelling, Tubs and Jar labelling, Can labelling, and Tube labelling and is easily adapted to work with tapered round containers and ridged & odd shaped containers. The Bottle-Matic is easy to set up and operate, making them an economical solution to relatively short runs and bespoke labelling. To ensure labels are applied correctly to small and lightweight containers all BM Bottle Labellers are fitted as standard with a pressure arm. The BM Bottle Labeller I is designed to apply 1 label to containers from a small patch to fully wrap around. 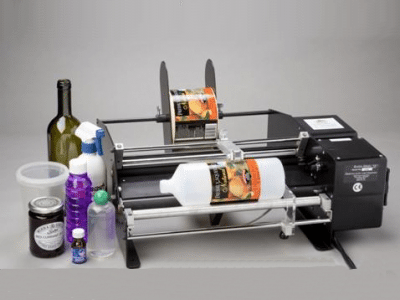 The BM Bottle Labeller II is an advanced model with the provision to apply 1 or 2 labels from the same roll, with a built in incremental dial to accurately space front and back labels on the same container.